For some, La Union is just a province that should be passed through on the way to famous destinations such as Baguio City or Ilocos provinces. However, lately, more and more tourists found out that it was worth it to stop by and really enjoy the laid-back feel of the province. And that's not just because of the beautiful beaches! There are actually a lot of unique and fun activities to do when in La Union. #1 - Surf in San Juan: Much of the reason why La Union finally caught people's attention is credited to the thriving surfing culture in Urbiztondo Beach in San Juan. Called the Surfing Capital of the North, both newbie and professional surfers will absolutely enjoy riding the waves. October to March is considered the surfing season in this area. #2 - Trek to Tangadan Falls: After about less than an hour of hiking, you will be welcomed by the breathtaking sights of lace curtain-like cascades draped on huge boulders and the refreshing pure cool water. The hike itself features scenic forests and streams. There are also perfect spots for cliff-diving that the brave souls must try. #3 - Stroll around Luna Pebble Beach: Not all beautiful beaches have fine sands, some have pebbles, like this beach in Luna! Known as the Pebble Capital of the North, its coastline is surrounded by vivid blue waters and smooth pebbles. While you're there, don't forget to visit the 400-year-old Baluarte Watch Tower and the Bahay na Bato, a house built from stones. #4 - Chill out and Relax: Experience ultimate staycation at La Union's finest accommodations ranging from luxurious to affordable hotels and resorts. Some of the famous resorts in La Union are Thunderbird Resort Poro Point, a Santorini-inspired 5-star resort, Kahuna Beach Resort and Spa, a Balinese-inspired resort, Vessel Hostel, a unique hostel that features repurposed container vans as rooms, and Circle Hostel, a hip budget-friendly eco-hostel. #5 - Pick grapes in Bauan farms: Yes, grapes not only grow in cold weather! Get fascinated by lines of vineyards in the grape farms of Bauan, La Union that are opened to the public for tours and grape-picking. Drop by one of those farms and if it's harvest time, you can pick your own grapes for pasalubong. 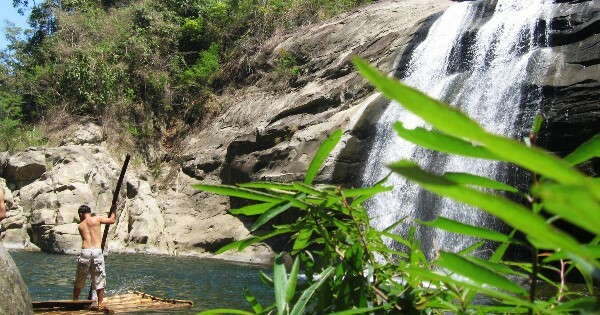 #6 - Adventure in Pugo: Tapuakan River in Pugo, La Union is considered the Cleanest Inland River of the North. Getting there is not that easy but having to enjoy the shallow flowing water accentuated by giant white boulders is refreshingly worth it. Not too far from the river is PUGAD, an adventure park that features rappelling, wall climbing, zip lining, ATV driving, a mini zoo, swimming pools, among others. #7 - Visit Ma-cho Temple: Established on a hill 70 feet above sea level, this Taoist temple in San Fernando features a towering building built by the city's Chinese community. It is also visited not only because of the majestic temple itself but also because of the perfect panoramic view of the West Philippine Sea and the city from the top.